Clarkson Sherman Fisher (July 8, 1921 – July 27, 1997) was a United States federal judge. Born in Long Branch, New Jersey, Fisher was a sergeant in the United States Army during World War II, from 1942 to 1945, and was a reserve sergeant from 1946 to 1949. He received an LL.B. from the University of Notre Dame in 1950. He, entering private practice in Long Branch, New Jersey from 1951 to 1964. He was a Councilman in West Long Branch, New Jersey from 1959 to 1964, serving as a member of the New Jersey General Assembly in 1964. He was a judge on the Monmouth County Court, New Jersey from 1964 to 1966, and on the Superior Court of New Jersey from 1966 to 1970. On October 7, 1970, Fisher was nominated by President Richard Nixon to a seat on the United States District Court for the District of New Jersey vacated by Reynier J. Wortendyke, Jr.. Fisher was confirmed by the United States Senate on October 13, 1970, and received his commission on October 16, 1970. He served as chief judge from 1979 to 1987, assuming senior status on October 1, 1987. He served in that capacity until his death, in Princeton, New Jersey. The courthouse-federal building in Trenton was designated in 1193. Fisher's son, Clarkson S. Fisher, Jr., also is a judge, having served on the Superior Court of New Jersey since 1993, and on that court's Appellate Division since 2003. 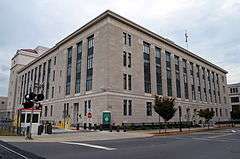 The Clarkson S. Fisher Federal Building and United States Courthouse in Trenton is named in his honor. Clarkson Sherman Fisher at the Biographical Directory of Federal Judges, a public domain publication of the Federal Judicial Center.